The writer has seen his share of L.A. County mines but until now had never viewed the one that is world renowned. 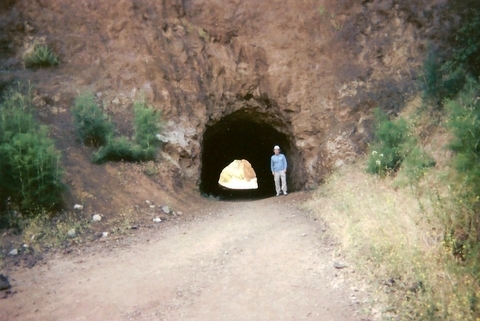 I am of course referring to Bronson Caverns also known as the Bat Cave in Griffith Park, which has been featured in hundreds of movie and TV shows, including the “Batman” TV series. This deficiency ended upon reading a Bat Cave report in the Los Angeles Times. I immediately drove to the mine, which is reached by going north up Bronson or Canyon Avenue from Franklin Avenue. Park at the end of Canyon Avenue in a small parking lot on the left. Then walk back down the road about 100 yards and cross a small concrete bridge on the left and follow a gated dirt road..After about 300 yards you will spot the large mine opening in the quarry on the left. The quarry was operated from 1903 to the late 1920’s. The mine’s main passage is 150 feet with two smaller passages totaling 100 feet for total passage length of about 250 feet. You can walk upright through the main passage and you don’t need three sources of light. In fact you don’t even need one.